You’re the one that ruins the holidays by not appreciating what Hello Kitty brings to them. A Kitty o lantern would be the dream of everyone and anyone that sees one will be filled with joy. You are getting tiring to read always being negative toward Hello Kitty. We are all going to leave your blog soon if you don’t change your ways. Oh no Darlene!! Don’t leave!! We will be so sad. Don’t you have some place in Sanriotown you want to be? Hello Kitty is a waste. Get over that you are stupid enough to fall for it and you are bitter that we aren’t. Can anyone tell me why on halloween people carve pumpkins and put light inside them? It looks pretty and I must be a lot of trouble doing it, but is the tradition behind it? Can anyone tell me why on halloween people carve pumpkins and put light inside them? It looks pretty and it must be a lot of trouble doing it, but what is the tradition behind it? I would love to know the story of jack-o-lantern. Just WHY? As A.l Hallow’s Eve isn’t marked in Japan, um, well, can’t the pumpkins hang around until out of season and then, seeing as no-one knows why you had them anyway, well, your wife could find other fruit and veg to try this on all year round. (Sorry, if I’m putting an idea in her head, but it springs to mind). Darlene, we’ve gathered you can read, so which bit of the ‘Hell’ part of ‘Hello Kitty Hell’ have you not understood? I live in Taiwan and it is Hello Kittyville here too. I thought I was alone in my revusion but now I have found some common ground so don’t feel so ill and isolated. Halloween is also a big deal here for seemingly no good reason, and seeing as I’m from New Zealand where Halloween is no big deal I have too put up with senseless american holidays combined with Kitty cuteness all rolled up together………..
Hi Absinth, here’s a short answer that leaves a lot out. Hallowe’en is derived from an ancient pre-Christian belief that the dead walk the earth on one day a year. Humans (originally adult men, now children) dress up as the dead and demand treats; when people give them treats, they’re symbolically placating the restless dead. Hence, trick-or-treating. Jack-of-the-Lantern was one such archetypal wandering ghost. He was beheaded, and his ghost carved a face into a hollow turnip, put a candle inside, and wandered Ireland looking for revenge, or his real head, or treats, or something (the myth varies a lot). People would carve faces in turnips and take them trick-or-treating. When this tradition came to the Americas, turnips were in short supply, but pumpkins were readily available. The turnip carving has died out, but the pumpkin jack-o-lantern is flourishing and apparently spreading to Japan. May I suggest that the kitty-o-lanterns can be rectified by carving horns, fangs or skull teeth into the existing design? And Darlene, my sweet, given that the walking dead are ancient and Hello Kitty is a few decades old, it is Kitty who is ruining Hallowe’en, not Hello Kitty Hell. Hallowe’en is not about sweetness and light and joy. Hallowe’en is about holy dread, fear of the unknown, the inevitability of Death and the uneasy suspicion that the dead are angry. Wake up and smell the zombies, woman. Your site is so funny! It’s cool that you have found a healthy way to deal with your wife’s obsession. She must be a good cook or something for you to put up with all the H.K. stuff, though. Hang tough, Dude! They have big sized pumpkins in Japan?? Like what they have in America? TeratoMarty, thanks a lot 🙂 In Portugal we don’t celebrate Halloween as you do… but the 31st of October is the Witches Day where people believe that on the night from the 31st to the 1st of november the spirits of the dearly departed wonder among us and that they may take innocent souls (like children) with them… the older people spend part of the night at church praying. The 1st of November is All Saints Day. It’s a kind of Halloween but without the legend, and without carving turnips or pumpkins 🙂 we do make pumpkin jam 🙂 want some? Thank you for posting that! I plan to carve my own. Look for it on my blog soon! Ooh, be sure to bring them in at night and put vaseline on them and wrap them in saran and store them in the fridge. 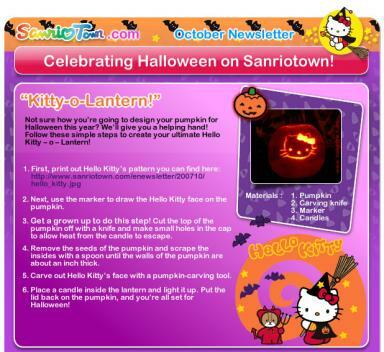 We want those gorgeous hello kitty pumpkins to last as long as possible!! Thanks so much for the link to the pattern! I’m making one tonight. I’m so excited!! Have you seen the hello kitty halloween costumes?